Leucadia is a beach community located in Encinitas, California that took on the “Keep It Funky” vibe when a group of English spiritualists first established it in the 1870s. One of its beaches, Beacon’s, got its name from a WWII-era aircraft navigation beacon which once stood on the bluff top. The iconic minimalist switchback trail down to the beach is a core feature that makes Beacon’s a special place and since the 1960s it has served as an icon of Southern California surf culture. But in June of 2018, local residents were blindsided when the City of Encinitas announced plans to construct an industrial Las Vegas-style concrete staircase to replace the existing minimalist switchback trail. Construction was set to begin in September of 2018. Plans included erecting a large, 40-foot wide seawall-type concrete staircase footing near the high tide line. Public beach parking would be reduced by 36 percent. The $4.2 million project that included an emergency exemption to bypass CEQA (California Environmental Quality Act) regulations was presented to the community as essentially a “done deal” without community input. To top it all off, on July 16th, the Surfrider Foundation formally endorsed the project. Locals were puzzled by the project’s surreptitious nature and aggressive construction timeframe. Rumors of political corruption began running amok in the small beach town of Leucadia. Still, following the initial project announcement, a group of concerned locals formed the Preserve Beacon’s movement to demand more government transparency, community involvement, and a less obtrusive solution. By the time the Encinitas planning commission met to review the project on July 19th, Preserve Beacon’s had garnered 1,000+ petition signatures opposing the project. Over 200 concerned beachgoers attended the meeting in opposition. Many gave heartfelt testimonies on how it all would destroy the character of their beloved beach. Ultimately, the Encinitas Planning Commission unanimously voted down the project, instructing city engineers to go back to the drawing board and involve the community to seek out less obtrusive solutions. 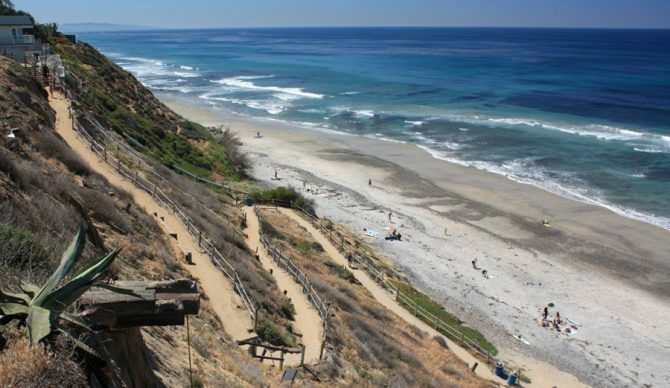 Now, the iconic Beacon’s beach trail has been left with some complicated competing interests: The Preserve Beacon’s movement is demanding a more transparent process which engages the community, ultimately hoping to lobby the City of Encinitas for an increased budget to maintain and enhance the existing trail. Of course, we’d prefer to have Surfrider’s support — we’re definitely trying to make friends, not enemies. Preserve Beacon’s gathered 1,000+ opposition signatures in just two weeks prior to the planning commission meeting, so geological details can be argued from either side but the consensus public opinion is a fact. An estimated 500,000 people visit this single beach every year. And like any nature trail, the Beacon’s trail is subject to erosion from foot traffic, wind, and rain. The City of Encinitas has neglected the trail over the past few decades, spending only $17,000 in the 2017 fiscal year on trail maintenance—a minuscule amount compared to the $4.2 million staircase construction budget. The neglect has led to concerns about the long-term viability and safety of the trail. So although Beacon’s is a quaint bluff-lined beach that mostly disappears at high tide, I sense that some local landowners and developers may want to see Leucadia transform into a booming tourist area which might be best served by industrial Las Vegas-style infrastructure. Encinitas City Council members may be motivated to show accomplishments by pushing through infrastructure projects ahead of the upcoming election. Meanwhile, the Surfrider Foundation wants to set a legal precedence of “managed retreat,” which allows coastal bluffs to fail naturally and replenish the beach with sand. This all leaves local beachgoers curious how erecting a de-facto 40-foot-wide seawall, reducing parking access by 36 percent, and bypassing CEQA regulations aligns with Surfrider’s mission. Beacon’s is public land, owned by The California Department of Parks and Recreation and leased to the City of Encinitas. Any major modifications are subject to both the terms of the lease agreement and approval from the California Coastal Commission. A series of community workshops are tentatively planned for Fall of 2018 to hear community input and guide the future of Beacon’s beach.